While I was in Kenya I was privileged enough to be able to visit a Maasai village. They are a proud people of around 1 million strong. Traditionally Maasai live in circular villages that are surrounded by a fence of thorns to keep out lions. Each house in the village is responsible for protecting the door next to their home from the invasion of predators at night. Women build the homes of mud, sticks and cow dung. This makes them well insulated, but dark. In the village that I visited small solar lights were being used to light the home as the daughter cooked dinner. The Maasai way of life is under threat as communal lands were broken up for individual use first by the British and then by subsequent Kenyan governments. Much of their land was also taken for the establishment of National Parks, including the Maasai Mara National Park on which they are no longer allowed to farm or use the water. But it is not an uncommon sight to see Maasai shepherding their goats into the park at Dusk or Dawn. 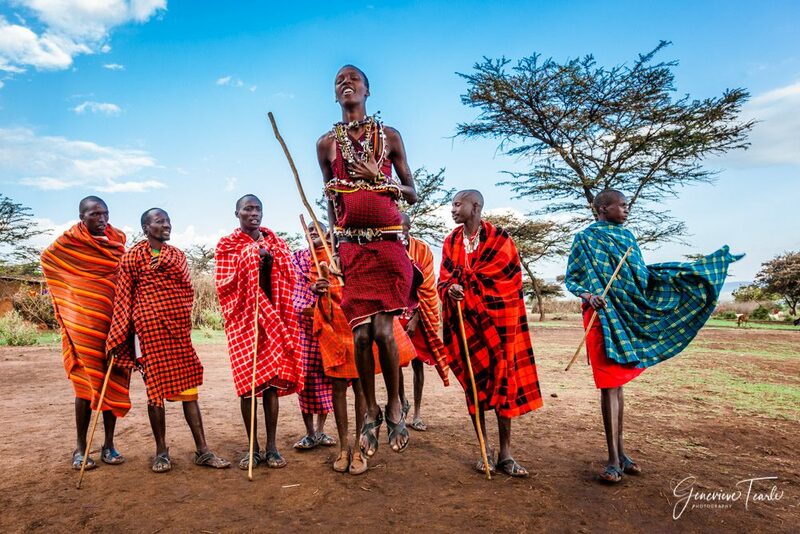 Traditionally Maasai boys spend 3-5 years in the forest learning to hunt as part of their tradition to becoming a man. At the end of this period they are circumcised on the ceremonial mound in the middle of the village. Their hair is tinted red with henna during this ceremony.